Oral arguments are set to begin before the U.S. Supreme Court on Dec. 8 in Evenwel v. Abbott, a case that asks whether the total number of registered or eligible voters — as opposed to the total population — should be used to draw up state legislative districts. The outcome of the lawsuit, brought last year by two Texas voters against the Lone Star State, has strong implications for the rest of the nation, particularly in states with significant minority populations who are ineligible to vote because they are legal permanent residents or haven’t turned 18. “About one in four Asians and Pacific Islanders are not yet citizens of the United States, yet most are eligible for naturalization,” Democratic National Committee spokesman Eric Walker told NBC News. The DNC filed an amicus brief for Evenwel v. Abbott in September. “Excluding these lawful permanent residents for the purposes of redistricting would significantly decrease their political power relative to other groups, such as the white plurality," Walker said. At the center of the debate is the “one person, one vote” rule and the Equal Protection Clause of the 14th Amendment. While the Constitution requires that congressional districts be drawn equal in population, the Equal Protection Clause is silent on which total population should be used in creating state legislative districts. Most states glean that data from the U.S. Census, a nationwide headcount conducted every 10 years that includes non-citizens, felons, and children. The U.S. Supreme Court ruled in 1966, however, that Hawaii could instead determine its legislative districts using total state citizen population since a large number of people counted in the Census—military personnel and seasonal tourists—were not Hawaii voters. A decision in favor of using the total number of eligible or registered voters to draw state legislative boundaries would likely be a boon to Republicans, who tend to live in areas with higher concentrations of voters, according to a May 26 Slate article written by elections-law expert Richard L. Hasen. This is especially true if such a ruling were ever extended to cover congressional districts. It would also benefit voters in rural instead of urban areas, where people ineligible to vote are more likely to live, Hasen wrote. “The vast majority of Asian-American residents under the age of 18 are citizens. If this cohort is excluded from the apportionment base, it puts the Asian-American community at a disadvantage." The case in Texas began last year when Sue Evenwel, a member of the State Republican executive committee, and Edward Pfenninger sued then Gov. Rick Perry, claiming that the state’s new senatorial voting districts, signed into law in 2013, were “malapportioned.” Evenwel and Pfenninger, who are represented by Project on Fair Representation, a conservative advocacy group, argued that the redistricting violated the "one person, one vote" rule since the vote of someone in a district with a high percentage of eligible voters would carry less weight than the vote of someone in a district with a low percentage of eligible voters. Last November, however, a three-judge panel of the Federal District Court in Austin dismissed their lawsuit, saying it was up to states to decide how to apportion state legislative districts. Around six months later, the Supreme Court announced it would hear the case. In their brief to the Supreme Court, Evenwel and Pfenninger, who live in areas with large numbers of eligible voters, say that states do not need to stop using the Census to draw up districts. Their brief also says that “total population data often protect the one-person, one-vote rights of eligible voters because non-voters typically are evenly distributed throughout a given jurisdiction.” But they argue that wasn’t the case in Texas. RELATED: Can This New App Help More Asian Americans Vote in 2016? “When total population figures do not protect eligible voters, demographic data that ensures ‘the vote of any citizen is approximately equal in weight to that of any other citizen in the state’ must be used in the apportionment process,” according to the brief. One such form of demographic data is an estimate of citizen voting age population, based on sampling from the American Community Survey, the most commonly used citizen estimate administered by the Census. But the DNC contends that the annual survey has limitations. The committee argues that it is based on a sample of a small share of the population, that it is backward-looking and that it would exclude “from the apportionment base young citizens who turn 18 after completion of the decennial redistricting process,” according to the brief. 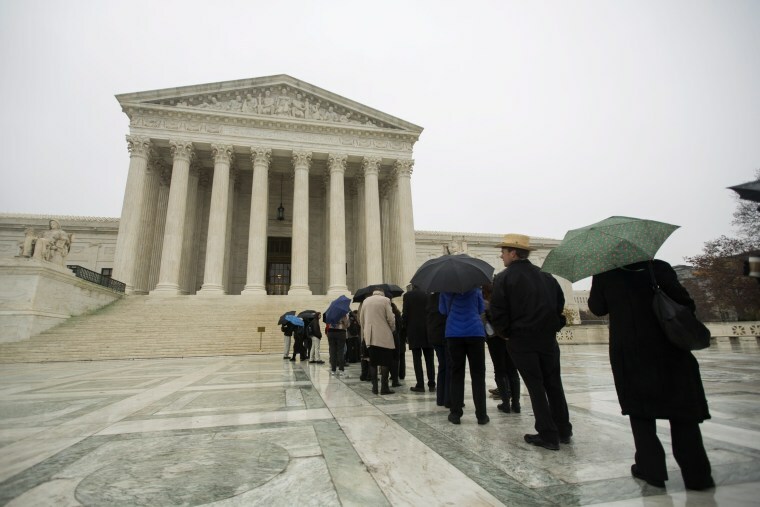 Four former directors of the Census Bureau also jointly filed an amicus brief urging the Supreme Court not to replace total population with either citizen voting age population or registered voters for drawing state legislative districts. But one group of demographers — among them the founding director of RAND Corporation’s Population Research Center — maintains that citizenship data from the American Community Survey is “reliable enough to allow states, like Texas, to draw, analyze, and adjust voting district boundary lines of substantially equal numbers of eligible voters,” according to the demographers' amicus brief. Walker, of the DNC, said using citizen voting age population would result in 45 percent of the Asian-American population and 30 percent of the Native Hawaiian and Pacific Islander population being excluded from the base used to draw up state legislative districts. “The vast majority of Asian-American residents under the age of 18 are citizens,” Walker said. “If this cohort is excluded from the apportionment base, it puts the Asian-American community at a disadvantage." In Evenwel and Pfenninger’s view, the Texas legislature did not “even make a good-faith effort” to configure state senate districts with roughly equal numbers of eligible voters, according to their brief. “Texas’ malapportionment of eligible senate voters is especially egregious because it could have substantially reconciled both total and voter population,” Evenwel and Pfenninger's brief argues. For its part, the DNC believes removing non-voters from the base used to determine state districts would result in harmful consequences for people of color, according to the DNC’s brief.